Earlier this year, I attended the Google Next conference in San Francisco and gained some first hand perspective into what’s possible with Google’s cloud infrastructure. Since then, I’ve been leaning on Google Cloud Platform (GCP) to run my trading algorithms (and more) and it has become an important tool in my workflow. 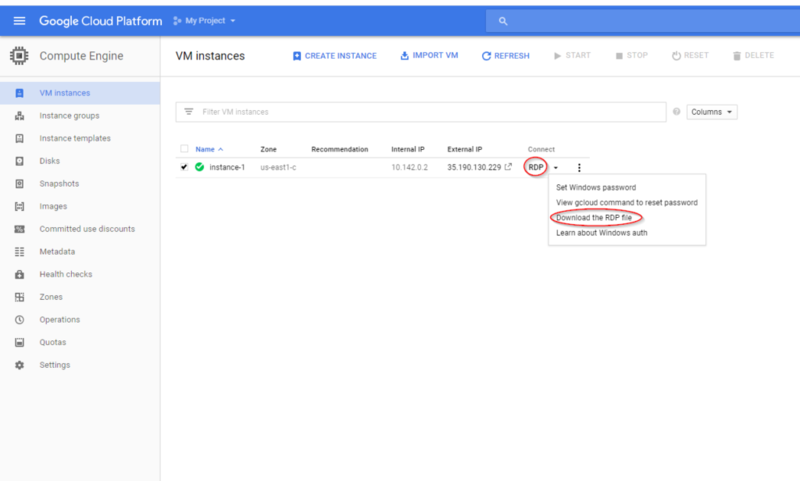 In this post, I’m going to show you how to set up a GCP cloud compute instance to act as a server for hosting a trading algorithm. I’ll also discuss why such a setup can be a good option and when it might pay to consider alternatives. But cloud compute instances are just a tiny fraction of the whole GCP ecosystem, so before we go any further, let’s take a high level overview of the various components that make up GCP. GCP consists of a suite of cloud storage, compute, analytics and development infrastructure and services. Google says that GCP runs on the very same infrastructure that Google uses for its own products, such as Google Search. This suite of services and infrastructure goes well beyond simple cloud storage and compute resources, providing some very handy and affordable machine learning, big data, and analytics tools. Google Compute Engine: on-demand virtual machines and an application development platform. Google Storage: scalable object storage; like an (almost) infinite disk drive in the cloud. BigTable and Cloud SQL: scalable NoSQL and SQL databases hosted in the cloud. DataLab: analytics and visualization platform, like a Jupyter notebook in the cloud. Cloud Machine Learning: train your own models in the cloud, or access Google’s pre-trained neural network models for video intelligence, image classification, speech recognition, text processing and language translation. Cloud Pub/Sub: send and receive messages between independent applications. Management and Developer Tools: monitoring, logging, alerting and performance analytics, plus command line/powershell tools, hosted git repositories, and other tools for application development. More that I haven’t mentioned here! The services and infrastructure generally play nicely with each other and with the standard open source tools of development and analytics. For example, DataLab integrates with BigQuery and Cloud Machine Learning and runs Python code. Google have tried to make GCP a self-contained, one-stop-shop for development, analytics, and hosting. And from what I have seen, they are succeeding. Host and run some software applications ( Zorro and R) that execute the code for the trading system. Connect to a broker to receive market data and execute trades (in this case, using the Interactive Brokers IB Gateway software). 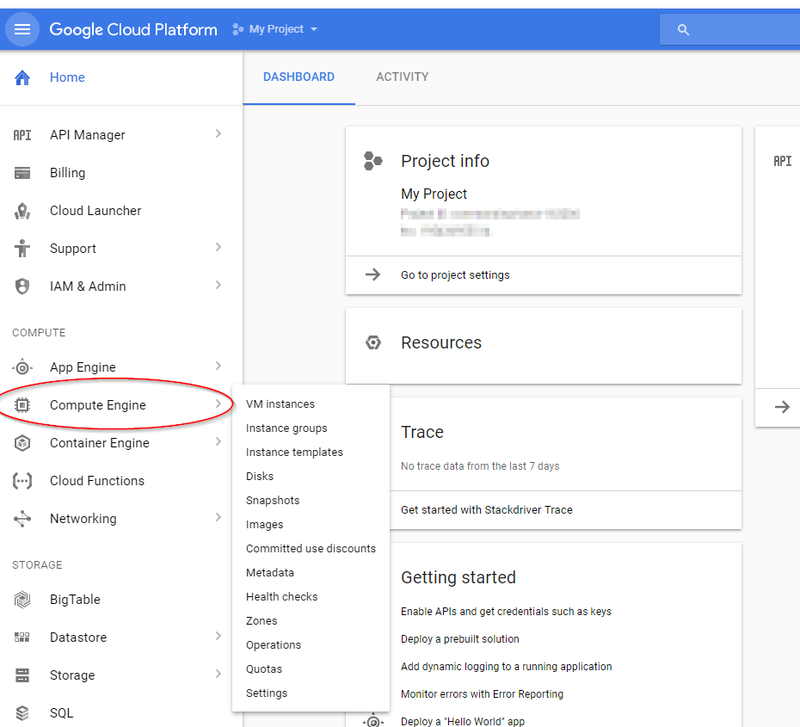 GCE allows you to quickly launch an instance using predefined CPU, RAM and storage specifications, as well as to create your own custom machine. You can also select from several pre-defined ‘images’, which consist of the operating system (both Linux and Windows options are available), its configuration and some standard software. What’s really nice is that that GCE enables you to create your own custom image that includes the software and tools specific to your use case. This means that you don’t have to upload your software and trading infrastructure each time you want to launch a new instance – you can simply create an instance from an image that you saved previously. Before we get into a walk-through of setting up an instance and running a trading algorithm, I will touch on the advantages and disadvantages of GCE for this use case, as well as the cost. There’s a lot to like about using GCE for managing one’s trading infrastructure. But of course, there will always be edge cases where other solutions will be more suitable. I can only think of one (see below), but if you come up with more, I’d love to hear about them in the comments. GCE abstracts the need to maintain or update infrastructure, which allows the trader to focus on high-value tasks instead, like performance monitoring and further research. The cost of a cloud compute instance capable of running a trading algorithm is very reasonable (I’ll go into specifics below). In addition, you only pay for what you use, but can always increase the available resources if needed. Imaging: it is possible to create an ‘image’ of your operating system configuration and any applications/packages necessary to run your algorithm. You can start a new compute instance with that image without having to manually install applications and configure the operating system. This is a big time-saver. Scalability: if you find that you need more compute resources, you can add them easily, however this will interrupt your algorithm. Security: Google claim to have excellent security and employ a team of over 750 experts in that field, and take measures to protect the physical security of their data centres and the cybersecurity of their servers and software. Uptime: Google commits to providing 99.95% uptime for GCE. If that level of uptime isn’t met in any particular month, Google issues credit against future billing cycles. 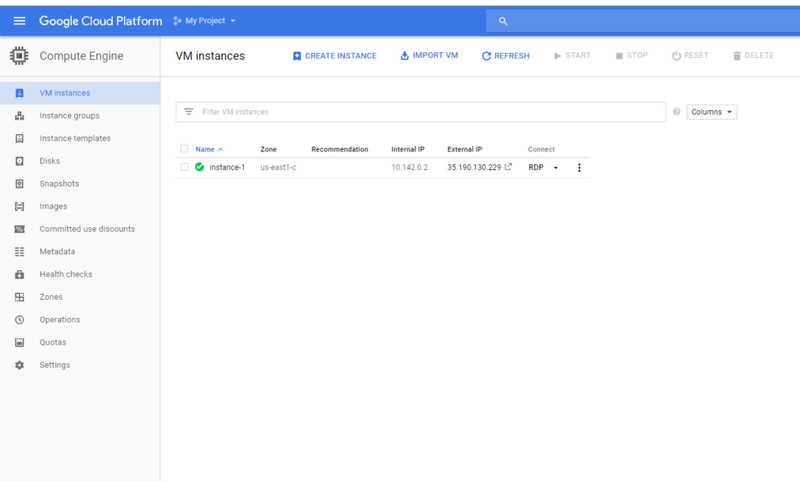 Access to other services: since the GCP services all play nicely together, you can easily access storage, data management, and analytical tools to compliment or extend a compute instance, or indeed to build a bigger workflow on GCP that incorporates data management, research and analytics. If your trading algorithm is latency sensitive, GCE may not be the best solution. While you do have some choice over where your algorithm is physically hosted, this won’t be ideal if latency is a significant concern. For the vast majority of independent traders, this is unlikely to be a deal-breaker, but it is certainly worth mentioning. I was almost going to list security as a disadvantage, since it can be easy to assume that if security is not handled in-house, then it is a potential issue. However, one would think that Google would do security much better than any individual could possibly do (at least, that’s what you’d think after reading Google’s spiel on security), and that therefore it makes sense to include the outsourcing of security as an advantage. This issue might get a little more complicated for a trading firm which may prefer to keep security in-house, but for most individuals it probably makes sense to outsource it to an expert. GCE is surprisingly affordable. The cost of hosting and running my algorithm is approximately 7.6 cents per hour, which works out to around $55 per month (if I leave the instance running 24/7) including a sustained use discount, which is applied automatically. Factoring the $300 of free credit I received for signing up for GCP, the first year’s operation will cost me about $360. This price could come down significantly, depending on the infrastructure I use, as I’ll explain below. I used an n1-standard-1 machine from GCE’s list of standard machine types. This machine type utilizes a single CPU and allocates 3.75 GB of memory, and I attached a 50GB persistent disk. This was enough to run my trading algorithm via the Zorro trading automation software (which requires Windows), executed through Interactive Brokers via the IB Gateway. The algorithm in question generates trading signals (for a portfolio of three futures markets) by processing hourly data with callouts to a feedforward neural network written as an R script, and it monitors tick-wise price data for micro-management of individual trades. The machine type I chose handled this job reasonably well, despite recommendations from Google’s automated monitoring that I assign some additional resources. These recommendations generally arise as a result of retraining my neural network, a task that proved to be more resource intensive than the actual trading. Thankfully, this only happens periodically and I have so far chosen to ignore Google’s recommendations without apparent negative consequence. I used a Windows Server 2016 image (since my trading application runs on Windows only) and a 50GB persistent disk, which is the minimum required to run such an image. The Windows Server image accounts for the lion’s share of the cost – approximately $29 per month. A scaled down version running Linux (Ubuntu 17.04) with a smaller persistent disk runs at less than half this cost: 3.4 cents per hour or $24.67 per month with a sustained use discount. Clearly there are big savings to be made if you can move away from Windows-based applications for your trading infrastructure. Also worth mentioning is that you are only charged for what you use. If you need to stop your algorithm in the middle of the month, you’ll only be charged for the time that your instance was actually running. Most of the niche providers of private trading servers will charge you at best for the full month, regardless of when you stop running your algorithm. As you can see from the previous descriptions, GCP consists of a LOT of different services. Finding one’s way around for the first time can be a bit tricky. 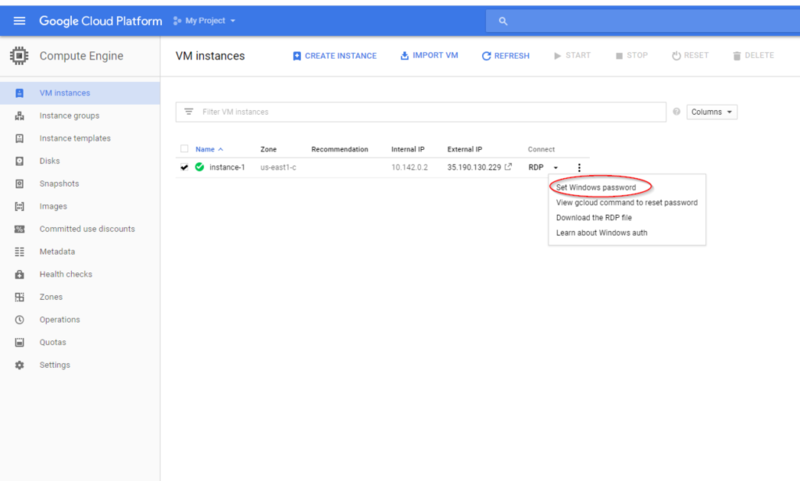 This part of the article consists of a walk-through on setting up and running a trading algorithm on GCE, aimed at the new GCP user. Go to https://cloud.google.com/ and log in to your Google account (or sign up for an account if you don’t have one). Note the $300 in free credits you receive for use within the first 12 months. I used one of GCP’s US east-coast data centres since IB’s servers are located in the New York area. My algorithm isn’t latency sensitive, but every little bit helps. Follow the prompts, and then copy the password and keep safe. Now you’re ready to connect to your instance! You can now upload your trading software and algorithm to your instance by simply copying and pasting from your home computer, or download any required software from the net. 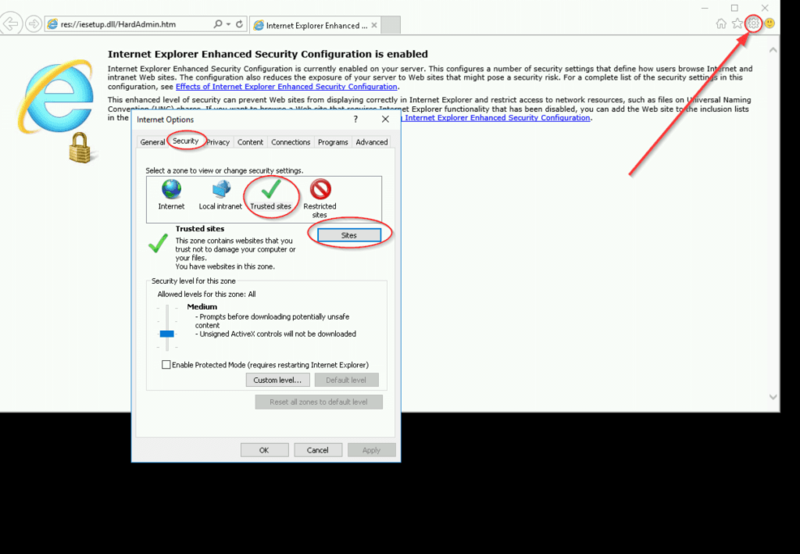 Note that to copy and paste from your home computer, you will need to access the instance using Windows RDP, not Chrome RDP (this may change with future updates to Chrome RDP). In Windows Explorer, navigate to the R installation directory and right-click it, then choose Properties. Click Advanced, then Change Permissions. Highlight your username, and click Edit. Choose Full Control under Basic Permissions. Step 6: Don’t’ forget to stop the instance! So long as you don’t delete the instance, you can always restart it from the same state at which it was stopped, meaning you don’t have to re-upload your software and scripts. You are not billed for an instance that has been stopped. On the other hand, if you delete your instance and later want to restart, you will have to create a whole new instance and re-upload all your trading infrastructure. That’s where images come in handy: you can save an image of your setup, and then start an identical instance from the console. I’ll show you how to do that in another post. 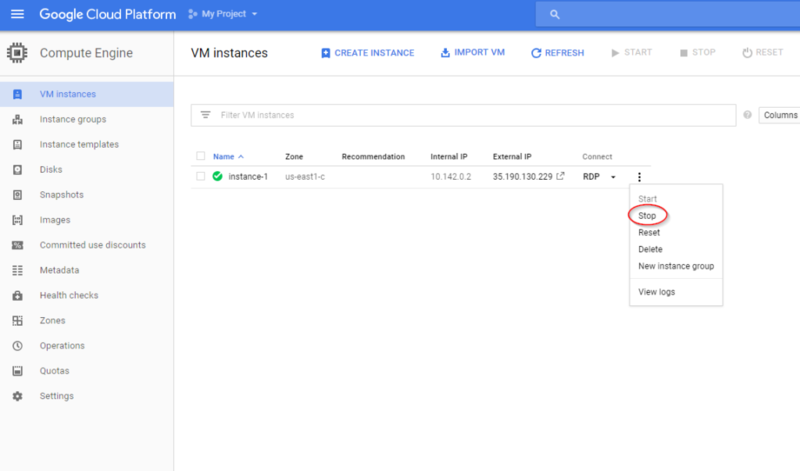 In this post I’ve demonstrated how to set up and run instances using the GCP Console. 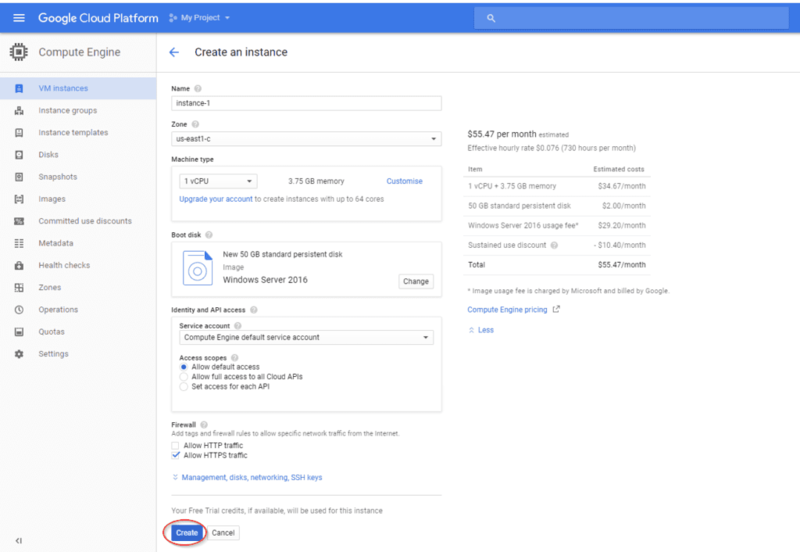 The same can be achieved using the Gcloud Command Line tool, which is worth learning to use if you start using GCP extensively thanks to the boost in productivity that comes with familiarity. There’s a lot that can be done on GCP, including big data analytics and machine learning. We can also apply some simpler workflows to make our lives easier, such as creating custom images as mentioned above, or integrating with cloud storage infrastructure for managing historical data and using Data Studio for monitoring performance via attractive dashboard-style interfaces. I’m in a good position to show you the ropes on how to use these tools in your trading workflow, so if there is something in particular that you would like me to showcase, let me know in the comments.